Scheduling a visit is a great way to get to know where you might be spending at least the next four years of your life. At Saint Rose, we hold events like Accepted Student Days and Open House, where prospective students and their families visit campus, meet with professors, mingle with other prospective students, and eat (tasty) food. There’s a lot going on during these events, so it’s helpful to have a prepared list of questions to ask tour guides, professors, and others while taking advantage of your personal College tour. Ask about Residence Life: For at least the first year of college, you’ll live on campus. This might mean you’re sharing a bedroom, a bathroom, and a washer and dryer with people other than your family for the first time. You’ll want to feel comfortable, secure, and happy in this space. Ask to see the college’s dorms and other campus facilities while visiting campus. You may not have as many options as an episode of “House Hunters,” but you will have more time to make a decision about where you’ll want to live. Ask about Transportation: A lot of colleges do not allow first-year students to park on campus. It’s important to know what other forms of transportation are available to first-year students. At Saint Rose, we have a shuttle system, and we partner with the Capital District Transportation Authority to provide FREE rides for students. Uber and Lyft are available, too. Albany also participates in a bike-sharing program. Plus, we’re located in a small city that’s completely walkable. You’ll literally have no excuse to be late anywhere. Ask about Student Life: Think about what else you might want to experience while getting your degree. Volunteer opportunities? Student government? Athletics? Or studying abroad? You’ll have a lot of different chances to get involved on campus. We have a step team, four a capella teams, a club baseball team, and even a club for students with naturally curly hair. There’s literally something for everyone. Ask about Academics: College visits are the perfect opportunity for you to get to know the program you’ll be studying until graduation. Meet with professors and take a deep dive into the program’s possibilities. Will you experience hands-on learning? Are internships required? Can you pursue a dual-degree? These are all questions you may want to ask professors while on a visit. BTW, the answers at Saint Rose are: yes, yes, and yes. Ask about Financial Aid: If you filled out the FAFSA, then you might have already received a financial aid package. At Saint Rose, 98 percent of undergraduate students receive financial aid, and the average institutional aid for first-year students in 2017 was $17,934. Sometimes, though, it’s difficult to understand where all this money is coming from and what you’ll need to pay back. While visiting campus, stop by Financial Aid and have a counselor answer questions about your financial aid package. Ask about Services: From information technology services to counseling support, you’ll want to make sure the college has the facilities and resources you’ll need to live a comfortable and healthy lifestyle. Having these supportive resources accessible on campus can help make your college experience more enjoyable. 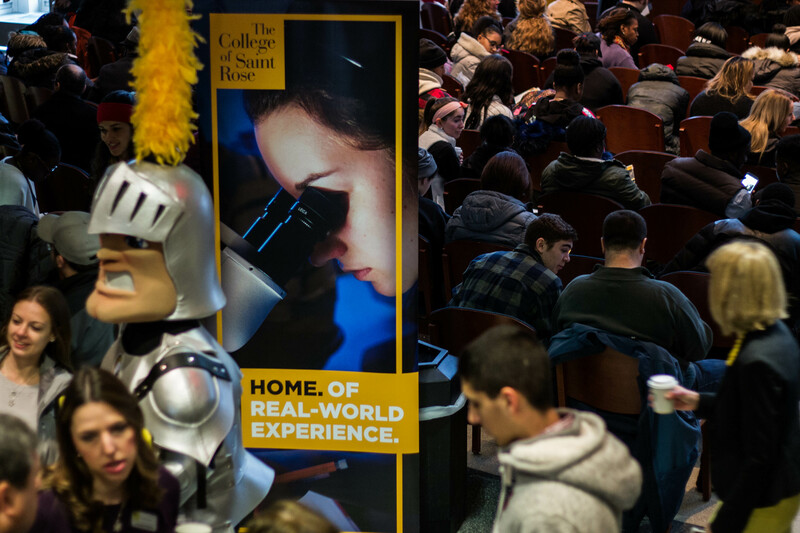 To schedule your visit to The College of Saint Rose, click here.